Whirling around the January trade shows, we bring you a recap of the most important events and details of the trend forecasts through 2017. 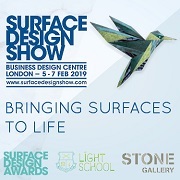 We’ve hit the ground running with Heimtextil, Maison&Objet, Paris Deco Off, imm cologne, Domotex, CHA Show (Craft & Hobby Association) and it doesn’t stop there! In this issue see in-depth coverage of the Theme Park, note the next color palettes, hot designs, and societal directions for the coming seasons. Get inspired with the February edition! Frankfurt — January is chock-a-block with major international trade fairs. This month you will be able to review in-depth coverage of the main features of the events we have covered, and after we have finished cross-referencing all of the data we collected ourselves we will bring you our reports—you know the drill. Here read up on important points we think you should note and learn about what’s new in hospitality. Frankfurt — One of the five cocoons in the Heimtextil Theme Park Well-Being 4.0 had the main focus of retail inspiration. In this cocoon the four trend directions outlined—Protect, Energize, Nourish, and Enrich—all played a part in setting the stage. Retailers across the globe have been reinventing themselves in the midst of the paradigm shift caused by online shopping over the internet. Perhaps the Trend Table can tickle your fancy here. Frankfurt — The apothecary meets cabinets of curiosities. Do we really appreciate the history behind where colors originate? Do you know which hues are sustainable and which are not? Which shades are synthetic and which are natural? You can learn a thing or two in this gallery on textile sustainability at Heimtextil, from the Aztecs to the Egyptians, from insects to fiber innovation. 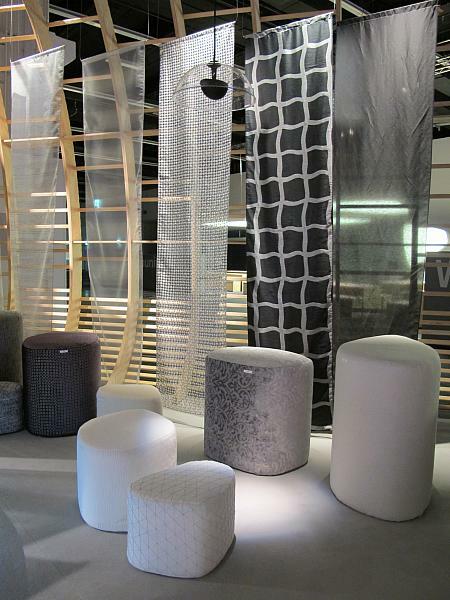 Frankfurt — Textile design is not limited to fabric anymore. At Heimtextil’s Theme Park in the Craft cocoon we see how other materials such as marble, ceramics, copper can influence the product development process. Or even riding a bicycle-like contraption to create a yarn adorned lampshade! Oodles of inspiration from textiles and beyond can be found within this gallery. Frankfurt — Color has a heavy impact on our everyday lives. From what we wear to how we decorate our homes, color is one of the strongest drivers behind our choices. Color can have an effect on our mood and our well-being, so it is no wonder that color therapy became a central point in the Technology cocoon within the Heimtextil Theme Park of Well-Being 4.0. Frankfurt — The physical and digital worlds collide in this trend direction for 2016/2017 as presented by the Heimtextil Trend Table in Frankfurt, Germany this January. The distinction between online and offline is greying, but these deigns are anything but. Vibrant colors and bold patterns with metallic touches and high volumes show that there is a bright future ahead. Frankfurt — As a society we are forever connected today and always turned on. It is time to protect ourselves not only physically, but emotionally and spiritually as well. As yoga and meditation practices are on the rise, so is the desire to bring that peacefulness indoors to one’s interiors with soft colors, comfy materials, diverse textures and subtle design. Frankfurt — Sustainability is a word we hear often in contemporary society, but what does it really mean? It was definitely a key factor in more than one area of the Theme Park. For the Nourish trend we see this green obsession take on quite a literal meaning in addition to organic designs and natural textures that highlight the hand-crafted. Frankfurt — A trend season does not pass without some type of ode to luxury. For a certain market opulence is always ‘in’ with slight fluctuations and nuances to make the ever-present trendy and fresh. 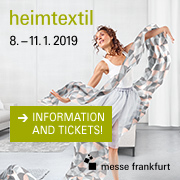 Heimtextil has done just that with Enrich, where visitors could walk through the textile trail and come upon lush velvets, feathers, marbles, pearls, metallics and more. Paris — WILD is the new vision from the Maison&Objet “Observatoire”, which reflects upon new consumption behaviors and the times in which we live. It may feel like a theme that is quite far away from what many of you consider to be your target market, but we cannot deny that 3D-printed ceramics, rust and oxidation marks, and creative uses of natural materials are gaining momentum mainstream. Anaheim — This January, Trendease visited the CHA Show (Craft & Hobby Association) in Anaheim, California. The show takes place at the Anaheim Convention Center and is an annual event where 370 exhibitors from 67 countries showed off 12,000 new products on the trade show floor. The winner of the best booth at the show was Lion Brands Yarn so Trendease hurried over to the booth to see why. Cologne — For this newsletter we journey to Cologne, Germany to explore the 2016 edition of Das Haus. It is the annual concept house erected in the design section of the imm cologne fairgrounds, each year a different curator is chosen. The 2016 installation was done by 34 year-old German designer Sebastian Herkner. Visit the “house that locks nobody out” here.